I read Sredni Vashtar as a young child and I’ve never forgotten it. Is The Open Window the one where a young man is heard singing “Bertie, why do you bound?” I didn’t understand it, but Ifound it really haunting. The children in these books are slightly, unsettlingly weird too, don’t you think? Yes, that’s the one! It’s very creepy, isn’t it? I wasn’t quite sure if the visitor imagines it all — he is clearly battling with his nerves — or if the men reappear as ghosts. There is an element of ambiguity about the story that makes it very intriguing. I agree with your point about the children too – they have a mischievous streak that could easily tip into more malevolent territory. I have heard very good things about Saki over the years. I tend to like stories about rebellion. I love the term ‘aunt-by-assertion’. Yes, I liked that term too – it says a lot about the lady in question! I think you would enjoy Saki a great deal. He definitely falls into that category of classic literature you seem to enjoy. Yes, an absolute delight! This collection was my first experience of Saki, and it proved to be a great introduction to his style. I would definitely recommend it as a suitable place to start. I love stories by Saki. I believe I have not read any of these and it would be such a lovely addition to the shelves. 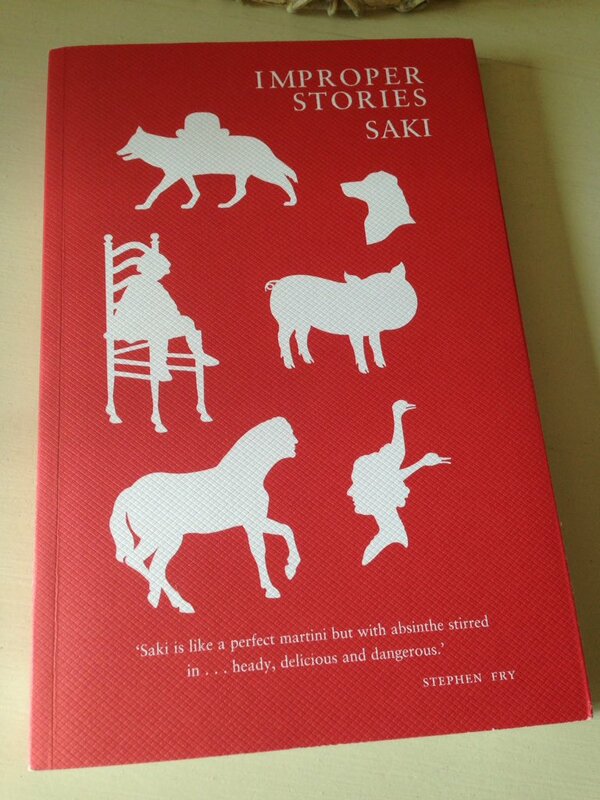 Oh, how wonderful to have had the chance to read Saki as part your schoolwork! That must have been delightful. Your comments about the nostalgia associated with certain stories has reminded me of Tove Jansson’s Moomin books. They formed such a huge part of my childhood as the books were passed around from one member of my extended family to another. I always think back to those days whenever I see something Moomin-related. How could anyone not like Saki? I’ve only read one volume and mean to read more. Domineering aunts, naughty children & animals and lazy nephews – it’s all good stuff. I love the title of one of his stories called ‘The Stampeding of Lady Bastable’. Thanks, Karen. Is that the Penguin edition of his stories? I have to say it looks very inviting indeed. A good one for dipping into every now and again. That first quote made me smile. I can’t think that I know anything at all about Saki. I don’t think I knew he would be so witty. It sounds like a really superb collection. He is eminently quotable, so much so that I was spoilt for choice when trying to select passages for this piece. He’s definitely a writer I would recommend to you, Ali. Max has already drawn the following comparison, but as it’s very apt I’ll repeat it here. Think P. G. Wodehouse and Evelyn Waugh (the satirical novels) with a dash of Roald Dahl’s Tales of the Unexpected thrown in for good measure – that’s broadly the kind of territory we’re in here. It’s quite possible that all of these writers were inspired by Saki, at least to a certain extent. I’ll keep Saki in mind definitely. It sounds like the author took great delight (mischievous delight?) in writing these! This is a book I’ve looked at once or twice having never read Saki so it’s great to get such a detailed review. He must have had a ball writing these stories, devising new ruses for riotous animals and devilish children. The scenarios he portrays are so delightful! I can only encourage you to give Saki a try at some point. He’s definitely worthy of attention. Looks like a lovely edition. Saki really is wonderful – Tobermory is one of my favourites! Your description above of Wodehouse meets Tales of the Unexpected is bang on. I loved Tobermory – such a neat idea for a story and yet creative too! It definitely struck a chord with me. I can’t take any credit for the references to Wodehouse and Dahl’s Tales of the Unexpected as they came from Max’s review (I’m pretty sure he mentioned them in the opening to his piece). Nevertheless, as you say, they are very apt – I think they help to give a flavour of what to expect. I’m very glad you liked this. It’s an excellent collection isn’t it? Yes, very good. Often with collections of short stories, there are two or three slightly sub-par pieces, fillers to pad out the gaps, but that didn’t seem to be the case here. They were all pretty strong. Thanks for writing about it in the first place, otherwise I might never have discovered the delights of Saki. I definitely feel as if I owe you one. You make this sound very appealing. While reading I remembered I’ve got a collection of his work. I’m very glad. You tempted me to get one. I’m surprised he’s witty. I imagined his stories were all on the Gothic side. Oh, I’m really glad to hear you have a collection of his work. What a treat you have in store there – I do hope it includes some of these stories. I wasn’t surprised by the wit, I must admit – but then again, I had the benefit of knowing something about this collection in particular from Max’s summary. Some of the stories definitely have a Gothic or eerie feel about them — pieces like The House of Fate, The Open Window, and The Music on the Hill — but the majority are more humourous in tone. I’m not sure how representative that is in terms of his body of work as a whole. Maybe someone else can offer a view on that? I have to take a closer look at my collection and see what I have. I might have two actually and one Iread ages ago and it was on the eerie side. Yes, it would. I liked both types, but the humourous ones were my favourites. I’ll be interested to hear how your collections stack up. Lovely review Jacqui. I’ve *almost* picked up collections by Saki before but been put off by my perceived disinterest in short stories (I like short stories, I just think I don’t!) and an uncertainty about the writer, but these sound marvellous, well worth the investment in time. I like the satirical tone and the focus on children and their antics, which make this sound like an entertaining and revealing read. Thanks, Belinda. Yes, it turned out to be a very entertaining read indeed, one of the tightest collections of stories I’ve had the pleasure of experiencing in quite a while. I do know what you mean about the prospect of short stories though – it’s often more tempting to opt for a full-length novel as it can seem more satisfying (at least in theory if not in practice). Nevertheless, I do tend to enjoy short stories once I get into them. Maybe it’s a case of finding the best way of fitting them into your reading time? I often have a collection on the go for those periods when I can only read for 20-30 minutes at a time – then I can read a complete story from start to finish without the narrative being interrupted by a break.